Below are the reflections of some of the Valkyrie Trek participants. 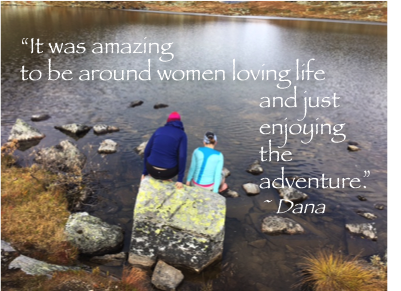 Hiking in Norway with other women was an experience I'll never forget. The silence of the mountain allowed for deeper silence within. Hiking above the treeline and seeing the lay of the land made me feel that I could walk forever, and I longed to. I wanted to learn all that I could from the mountains I was visiting. I was challenged physically and emotionally, seeing the limits I place on myself and, by putting one foot in front of the other, move past those limits. 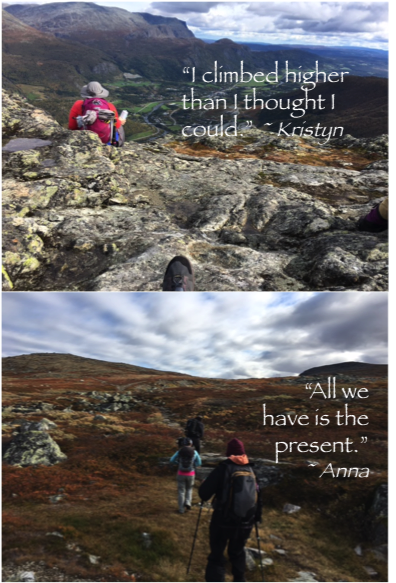 I felt a wonderful comaraderie with the women I was hiking with, sharing in their challenges and accomplishments, as they did in mine. I am looking forward to my return to Norway next fall. I feel like it's difficult to describe this trip and what it meant to me because for me the Valkyrie Trek included my preparation, training, and all the benefits I gained as a result. I got stronger, and I got fitter, but I didn't know how much I could really do until I reached the top of Storehodn in Hemsedal. On my way up, I encountered my fears. At one point, I looked at the path ahead of me, and I saw a rock gully which appeared to go straight upward. I realized had I encountered this scene back home I would have assumed it was too dangerous to forge ahead. But I watched the women ahead of me keep going and disappear out of sight. I had no choice but to keep going. (I did have a choice, but I knew I was on a spiritual journey, and I knew I was going to keep choosing to go forward, despite my fear and anxiety.) And that's exactly what I did. When I got to the summit, I felt a mixture of disbelief, relief, and an indescribable feeling - a new un-nameable feeling - in my chest. I carried that feeling all the way down the other side of the mountian, as I picked my way down, feeling strong and really kind of badass. By the time we were walking around the village, I was strutting and standing taller than before. I think I discovered the meaning of confidence somewhere up on that mountain. Sometimes after my return home, I would ask myself how I accomplished what I did. Again and again, I came away with the words, "One step at a time." And I remember that now when I face a new challege. One step at a time. The Valkyrie trip was a powerful experience of personal growth and sisterhood. The trip forced me to train months in advance. Every week I pushed past my expectations of my own ability. Once in Norway I had the opportunity to put my training to the test. Every day on the mountain I was forced into the present moment. Hiking became filled with hyper focus and profound silence. Every step I took made me realize how truly responsible I am for every decsion in my life. The mountains gave me the opportunity to hear the voice of fear and choose to push past it. The Valkyrie trip surrounded me with women who, like myself, were growing and loving the experience. I'll never forget Kimberlee's yell of triumph at climbing the summit at Storehodn. It was amazing to be around women loving life and just enjoying the adventure. The Valkyrie trip taught me so much; next year you couldn't keep me away. The trip to Norway definitely taught me a lot about myself, physically and mentally. I was pushed to keep going even when I was tired and sore, even when it was cold, even when I was afraid. However, I wasn't being pushed by others; I was pushing myself. I learned a lot about how much I could really do. I hiked steeper hills than I ever have before, and I climbed higher than I thought I could. While the trip was physically challenging, the mental challenges I faced were perhaps even greater. I realized how unsure I was of my own footsteps early in the trip. But with Jehanne's guidance, I was able to "trust my boots" and trust that I could step with a stronger sureness and confidence, which helped tremendously on later hikes. I also had to face many of my own fears. Fear of falling, fear of being sore, fear of being tired, fear of heights, and so on. We are so often prevented from doing things by our own unfounded fears, and this trip made me push those fears aside. Overcoming my fears and being challeged was very rewarding, but what I found most incredible was the extreme focus I gained while on the mountains. Especially on our second hike (which involved steep ascents and climbing rocks) I found that I was drawn into a kind of focus I rarelyhave in regular life. In order not to cause harm to myself or the other women with me, I had to be totally focused on the present. That total focus and presence meant there was no room for fear or idle thoughts or exterior distractions. That experience of presence and focus was unforgettable, and it is something I am working hard to recreate in all aspects of my life. My experience on the Valkyrie Trek was life changing. Several times on the trip, we were told that the mountains don't lie and that was absolutely true - they show you who you are. It was in those mountains, putting one foot in front of the other, that everything melted away and all I had was the present moment - one step after the other; one breath after the next. That is the lesson that I take with me into my life each day - that all we have is the present and that I just keep putting one foot in front of the other, no matter what. There was such peace in that space on the mountains and everything was possible. The mountains showed me the "burdens" that I did not realize I was still carrying and I put them down there. I remembered who I am and the strength and resolve of my heart in those mountains. I did more than I thought was possible, yet again pushing the boundaries of my mind and yet again seeing that those boundaries are a complete fantasy. The whole experience was nothing short of profound. Being in the moutnains in Hemsedal, I also came face to face with the true reality that I am the only one responsible for myself and my life. I am responsible for where I place my foot with each step, for the life I have, for the choices I make, for the thoughts I think. That is a truly freeing realization because there is no one else to blame and all things are possible. Everything that matters - the only thing that matters - lies within. Again, I remind myself of that truth throughout each day so that I know that no one can take anything from me that I do not choose to give. The location is also mind-blowingly beautiful! The pictures can hardly capture the vast and stunning landscape. It was absolutely breathtaking no matter where we were. The food was also extremely delicious everywhere and it was fantastic to be in apartments where we could do our own cooking. Words cannot descirbe how grateful I am for every moment of that trip. I was shown and learned so much and came away with so much more peace and determination. It was also incredibly inspiring to watch all of the women on the trip face challenges and push through and to form such a strong bond with each other. It is a bond forged in strength, honesty, joy, laughter, determination and passion. The Valkyrie Trek was an increible and profound experience - one that I will never forget. The Valkyrie Trek was an amazing trip that made me want to have every vacation be a hiking vacation. I enjoyed this adventure for many reasons, but foremost I felt a stillness in the mountains and within myself that I have never experienced anywhere else. Hiking the terrain requires you to be completely in the moment, which allowed me to accomplish hikes without fear or judgement, and it also allowed me to observe my surroundings in ways I rarely do in my day-to-day life. Norway is a special place where sitting outside in cool weather to enjoy a hot beverage doesn't seem to phase the locals at all. This time I drank my hot chocolate inside the cafe, but one day I hope to shrug off the cold with the same experienced indifference as the locals. When not hiking, I had a good time visiting the Viking town, eating at the brew pub in Flam, and stalking bargains in Hemsedal's sport shops. The Stave church was a fun outing that was equal parts creepy and storied Nordic history. My experiences on the Valkyrie Trek are ones that I truly treasure. It was exhilerating to exercise my warrior spirit, and I would highly recommend this trip to anyone who feels an affinity for the mountains.